However, I am no competition for my many snowbird friends from up north who are now here in South Florida “for the season”. Everyone seems to be taking to the golf course, the tennis court, the basketball court and/or the pool. And it seems, that most everyone, still coming out of the northern winter’s cold grip, is hurting somewhere – spraining and straining something. In addition to every new restaurant since last year, everyone seems to also know where all the drugstores are located, and the names for all new, emerging pain medications. Last week, over dinner on the Intracoastal with a college roommate, her golf-crazy husband asked me if acupuncture could help his increasing back pain. As I watched him take his sixth dose of over-the counter non-steroidal pain-killer, my answer was an immediate “Yes”! While not technically a “sports injury”, acupuncture has helped soothe my aching neck and shoulders from being hunched over the keyboard and/or my tablet. Acupuncture has helped lessen the pains of aching knees, back and hips after I have worked out. Acupuncture has thankfully kept me off of anti-inflammatory medications that I would routinely take after a particularly difficult gym session or when my body chooses not to unfold from “the child’s position” or as I trip over my “downward dog”. I was happy to bypass the over-the-counter medications; for me – and for others – they cause unpleasant gastrointestinal side effects. The general definition of sports injuries includes all acute injuries and chronic ailments due to specific activities and are usually related to musculoskeletal conditions. Sports injuries can include problems that arise from physical training, martial arts, completive sports, “weekend warriors”, outdoor activities, and competitions. Participation in these categories commonly stress and/or damage muscles, ligaments, tendons and joints. “Sports medicine” has evolved into a specific medical category that focuses on treating these illnesses. More common names of injuries that sprinkle our day-to-day conversation include, “tennis elbow, pitcher’s shoulder, golfer’s elbow, low back strain, trick knee, ankle sprain, tendonitis, shin splints and trigger finger.” Unfortunately, you don’t have to play the actual sport to suffer the consequences; last month, my orthopedic told me I suffer from a “pitcher’s shoulder”. Ironically, my last exposure to anything baseball was watching the New York Mets (on television, from the comfort of my couch) win the 1986 World Series. My orthopedist prescribed drugs; I made an appointment with my acupuncturist. Acupuncture can help both men and women recover from Sports Injuries of all types. The Acupuncturists are licensed, skilled and experienced physicians that can help get you back on track in no time. 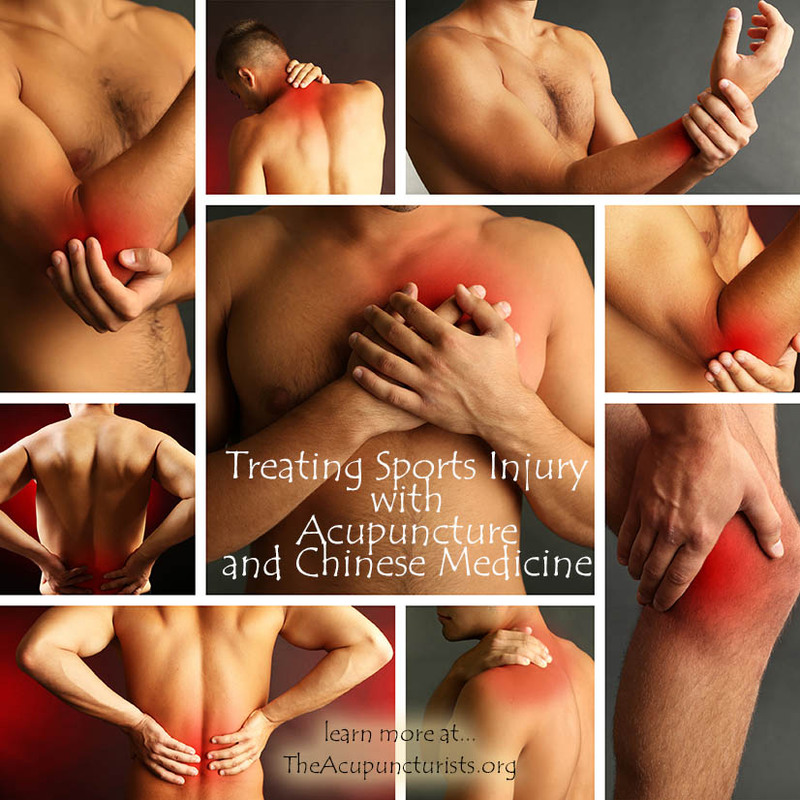 Acupuncture has proven to be quite successful in treating many sports injuries. Many professional sports teams have acupuncturists on staff to decrease healing times and resolve stubborn ailments. The use of acupuncture to treat acute injuries from intense or repetitive physical activity began centuries ago. It was – and still is – one of the primary means of quick healing for the martial arts. Specific acupuncture styles and techniques were developed to stop pain and dramatically increase recovery time. This tradition continues today and its use has expanded into competitive athletics that result in similar injuries. My acupuncturist explained that acupuncture is effective for sports-related injuries because it reduces pain while increasing range of motion. Acupuncture increases recovery and healing time and helps to strengthen weakened parts of the body. Acupuncture accomplishes this by decreasing inflammation, reducing swelling, relaxing muscles and relieving spasms. Acupuncture has been shown to decrease bruising, lowers the body’s pain response and improves local blood circulation to increase the delivery of nutrients and the removal of noxious elements. In short, acupuncture presses the “start” button on your body’s ability to heal itself. Related – Learn more on how Acupuncture Works! In Western cultures, athletic trainers and therapists who treat injuries have traditionally focused on controlling pain and inflammation. Sprain and strain of the joint and surrounded tissue are one of the most common sports related injuries (sprain involves the ligament and strain involves muscle or tendon). Besides pain, the typical inflammatory response may include swelling of the injured area, redness or purple skin discoloration, and reduced range of motion of the joint. In addition to conventional R.I.C.E (Rest, Ice, Compression, Elevation) treatment, many athletes have found acupuncture treatment to be very helpful in suppressing inflammation and swelling fast. With less inflammation there is less pain and less swelling and the athlete (or in my case, the “Daily Life Warrior”) will return to normal function more quickly. Unlike ice treatments, acupuncture is based on the idea of stimulating the body’s “qi” or energy, to restore balance within the body (the Yin and Yang). During an acupuncture session, thin. sterile needles stimulate certain points along the skin to impact the nerves and change the flow of energy in the body as well as promote increased blood flow to stimulate healing. Research has shown a link between acupuncture and increased white blood cells and serotonin levels. These levels boost weak immune system and improve a person’s feeling of welling being. In fact, just as “sports medicine” has evolved in the West, “sports acupuncture” has evolved as well. Sports acupuncture is becoming a recognized treatment for many once-called sports injuries, including but not limited to, frozen (pitcher’s) shoulder, tennis elbow, back pain, pulled tendons, torn ligaments, tendonitis, arthritis, bursitis, sciatica, tight hamstrings and various muscle/tendon strains. The goal of sports acupuncturists is to bring the body back to balance by understanding the compensation patterns presented with each sports-specific injury. 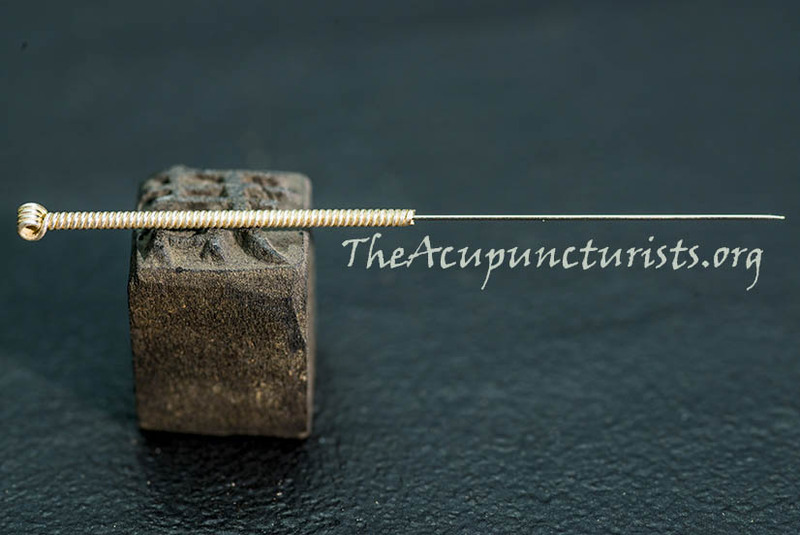 Acupuncture needles are super thin, sterile and virtually painless. Most insertions you will not feel, some only a slight pinch. The benefits are numerous! While acupuncture has been documented to help with optimal performance and a faster recovery, acupuncture has shown it also helps with injury prevention. Areas such as the back, hips and legs can be treated directly to become more flexible. This renewed flexibility causes less stress on the joints which, in turn, reduces the possibility of suffering tears and sprains. If only by watching the Olympics on television these past years, we couch potatoes have been exposed to many Eastern, Traditional Chinese Medicine treatments for sports pain. While acupuncture is a key component of Traditional Chinese Medicine, no one can lessen the impact of volley baller Kerri Walsh-Jennings wearing – during the Summer Olympics in Beijing – “kinesio tape” – sticky strips applied to the body that may improve blood flow. At the Olympics in Rio, the purple rings on swimmer Mark Spitz’s shoulders introduced us all to the TCM practice of “cupping”. Over 3,000 years old, “cupping” involves placing cups on the skin and creating a strong suction force that leads to bruising. The increased blood flow to the affected area is thought to stimulate both healing and muscle relaxation. Scientific study and shared results of acupuncture studies are overwhelmingly positive: By 2017, acupuncture was recognized by the World Health Organization to be a safe and effective treatment option for injuries, pain, (both chronic and acute) and for various orthopedic conditions. Neuroscientists at the University of Rochester in 2010 discovered that needling muscles sends adenosine to the site of punctured and inflamed tissue. Adenosine is a natural stimulant for tissue repair. In 2015, another study found that regular acupuncture treatments increase the level of T-cells in the body, safeguarding one against illness. Interviews with professional athletes include credit to acupuncture for natural boosts to energy levels, increased mobility, aids in post-work-out recovery and speeds up recovery time. As a non-sports person who can manage to pull a muscle or strain myself in just day-to-day living, I am extremely grateful to be living in a time when both Eastern and Western options are available for muscle and joint pain. I am grateful that so many top athletes are vocal in their support of acupuncture and Traditional Chinese Medicine remedies for sports injuries. I’m also grateful to be able to share this information, be it in a blog post or over dinner with old friends. The Acupuncturists – experienced, skilled physicians – serve the cities of Margate, Coconut Creek, Coral Springs, Tamarac, Parkland, Deerfield Beach, and West Boca. They offer free consultations and are in network with many insurances.